RJ has join forces once more with one of the world’s biggest entertainment companies, Warner Bros. Consumer Products, on behalf of DC Entertainment. 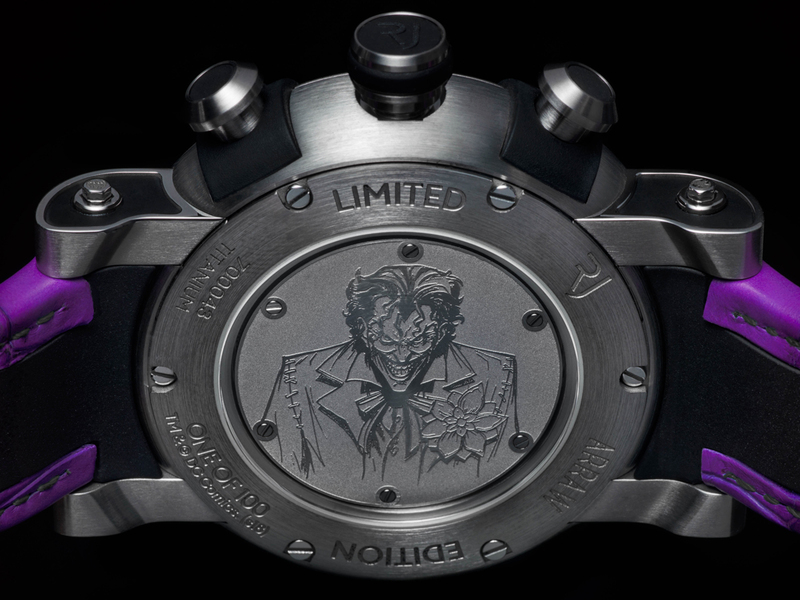 For its latest creations, RJ is channelling its dark side with the launch of two DC Comics Villains watches that are inspired by two of Batman’s biggest enemies: Two-Face and The Joker. 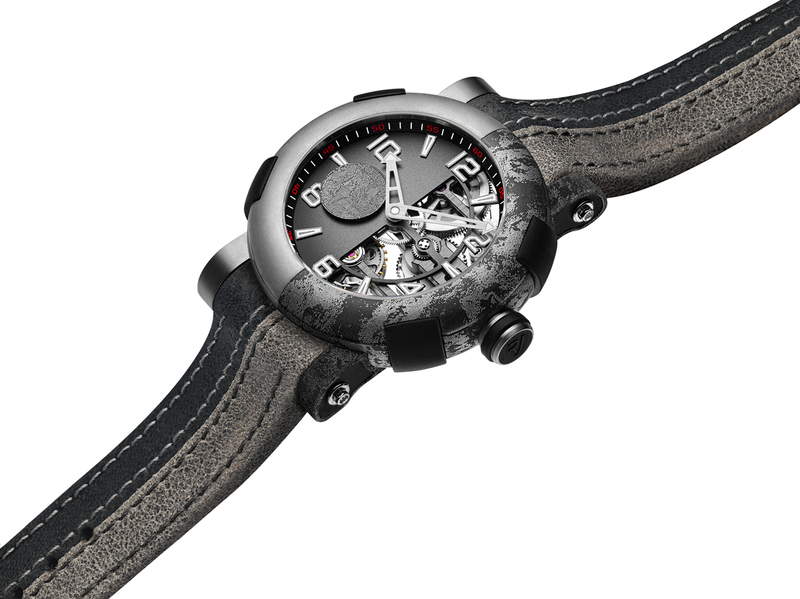 Using watchmaking techniques that are exclusive to RJ, the ARRAW Two-Face watch uses a skeleton movement and distressed design cues to evoke the twisted physical and mental state of the crazed criminal. The left-hand side of the watch is intentionally clean and structured, while on the right side, the three-layer skeleton movement is exposed to show the inner workings of the watch, as if acid itself had burnt away the outer casing and dial. 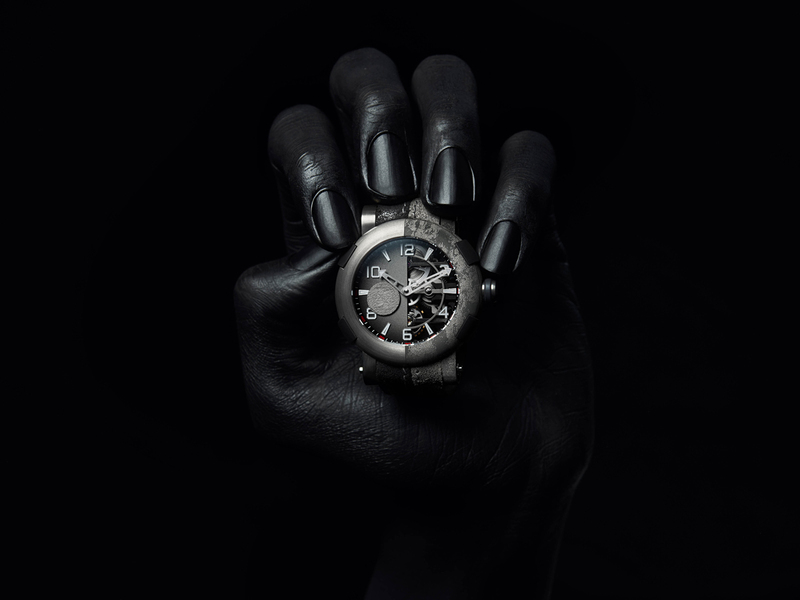 The ARRAW Two-Face watch uses a half-exposed manual skeleton movement with 48-hour reserve. Designed by RJ, the movement features chamfered edges and straight angles and sits within a circular satin-brushed 45mm titanium ARRAW case. 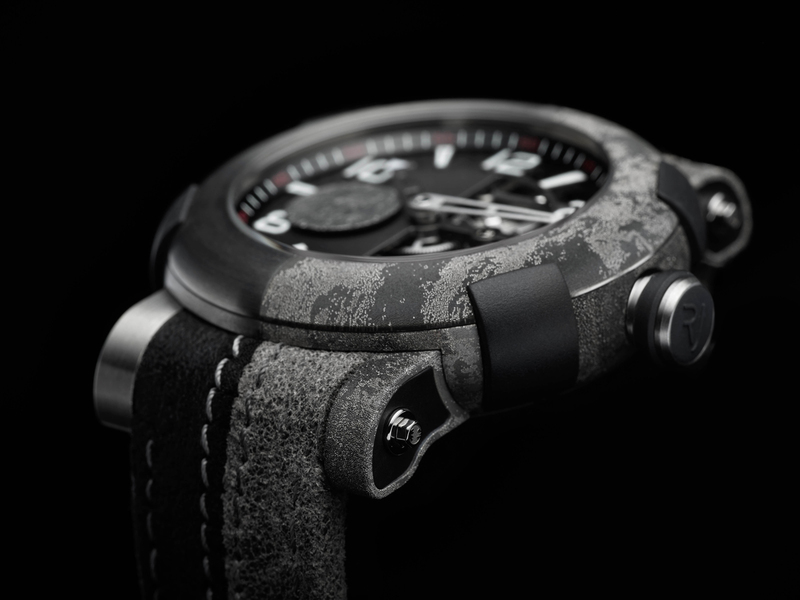 Like the watch itself, the calf leather strap is designed to have a clean and distressed side. Using a process unique to RJ, the right edge of the strap is given both a visual and tactile nature. 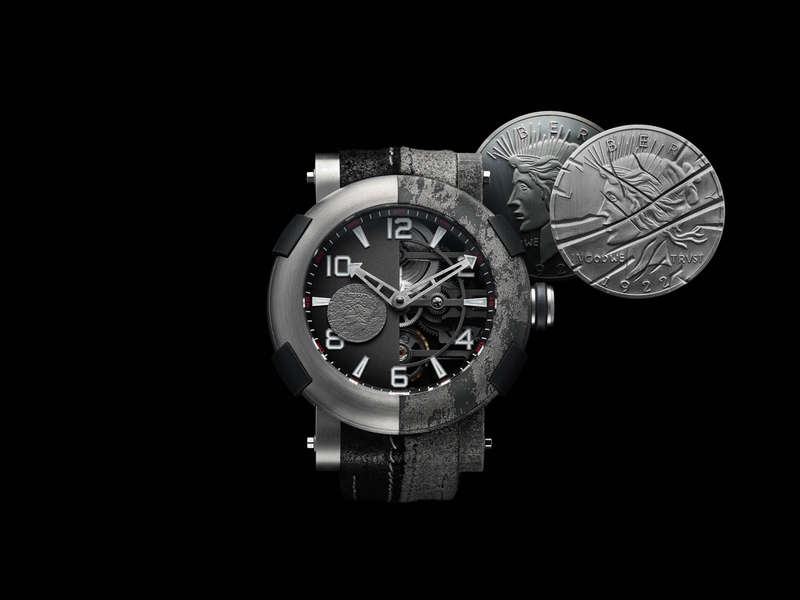 As part of the collectors’ edition, each watch will be presented with an exclusive Two-Face coin, specialy struck to commemorate the creation of the watch. The new RJ ARRAW Joker watch is inspired by the cunning criminal and perfectly reproduces the aesthetic of the comic strip villain. 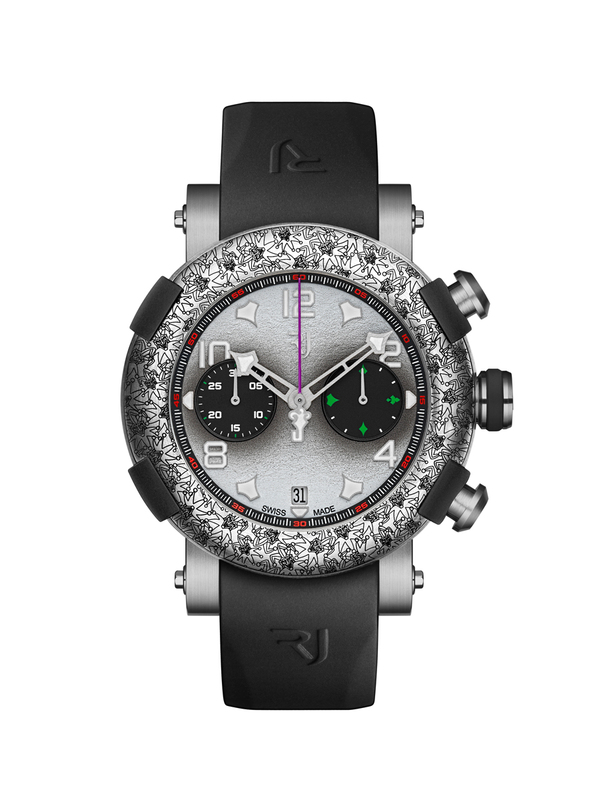 The ARRAW Joker chronograph is presented in a circular satin-brushed 45mm titanium version of RJ’s ARRAW case. 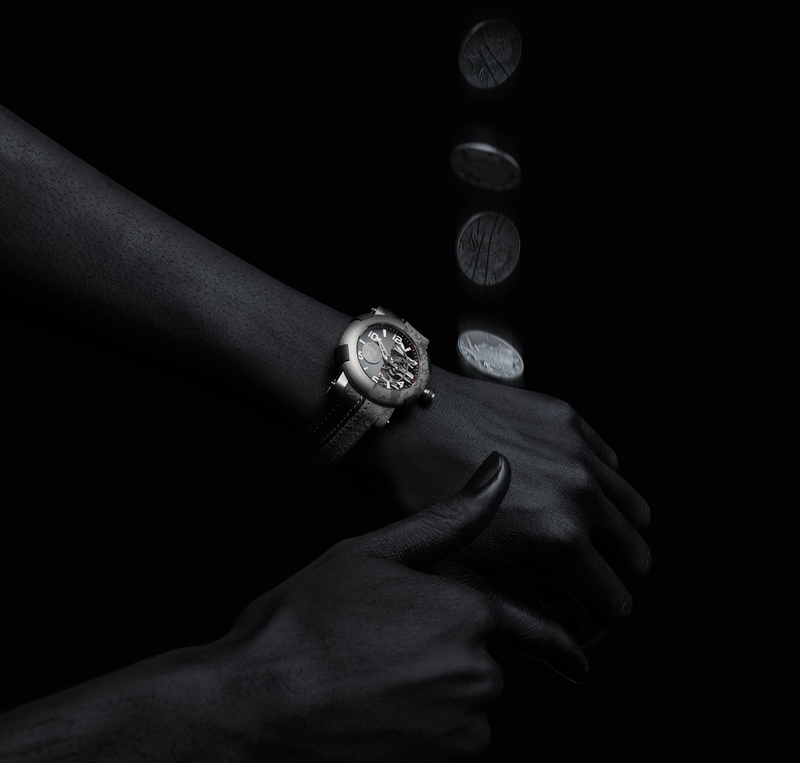 Noticeable for its four iconic rubber RJ BumpersTM, the ARRAW watch case is crowned by a titanium bezel that is laser engraved with an intentionally chaotic Joker motif. 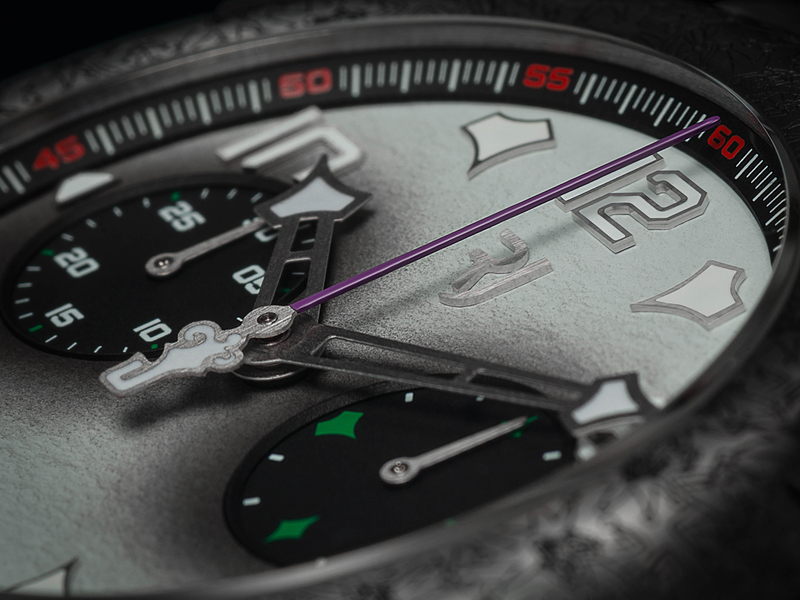 Beneath the anti-reflective sapphire glass, each Joker dial in the 100-piece limited edition is individually hand-painted, meaning no two Joker watches will have the exact same make-up. The watch dial itself is a stylistic interpretation of the Joker’s own face, with a pressed ‘plaster’-finish that is then intricately airbrushed to evoke the make-up of the Gotham villain: two black eyes sit at the centre of the dial which fades to white at the edges to reflect the Joker’s striking skin tones. 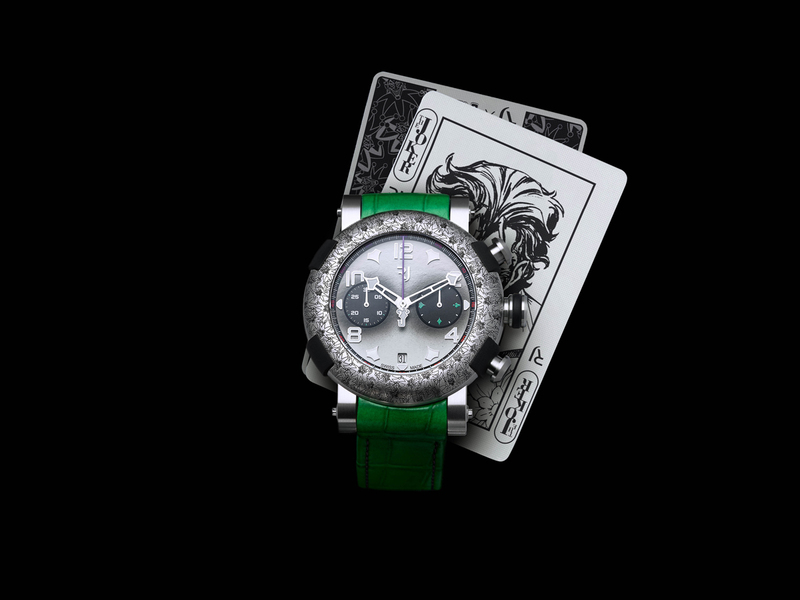 Every RJ ARRAW Joker watch comes with three interchangeable straps. 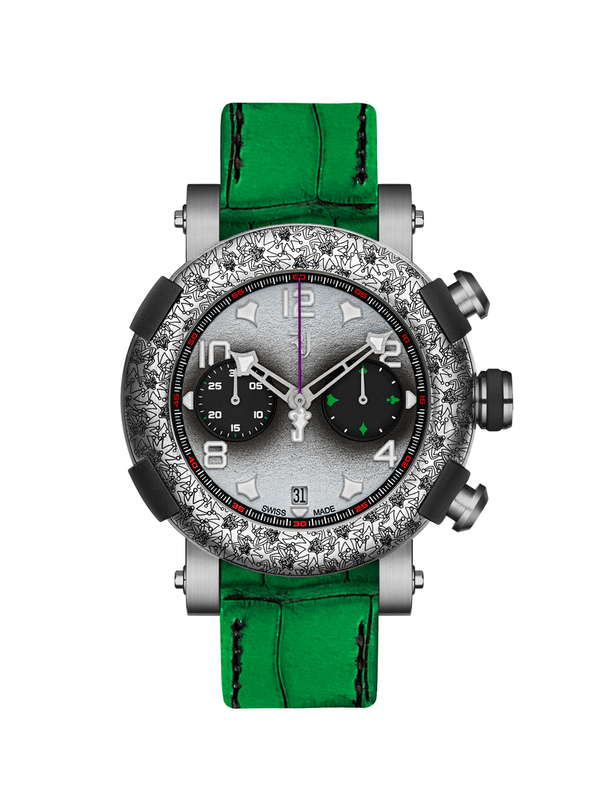 Colourful alligator skin versions in bright green or purple with contrast stitching match the Joker’s hair and clothing and can be easily swapped by simply pressing the Batman logo release screw on the watch lugs. 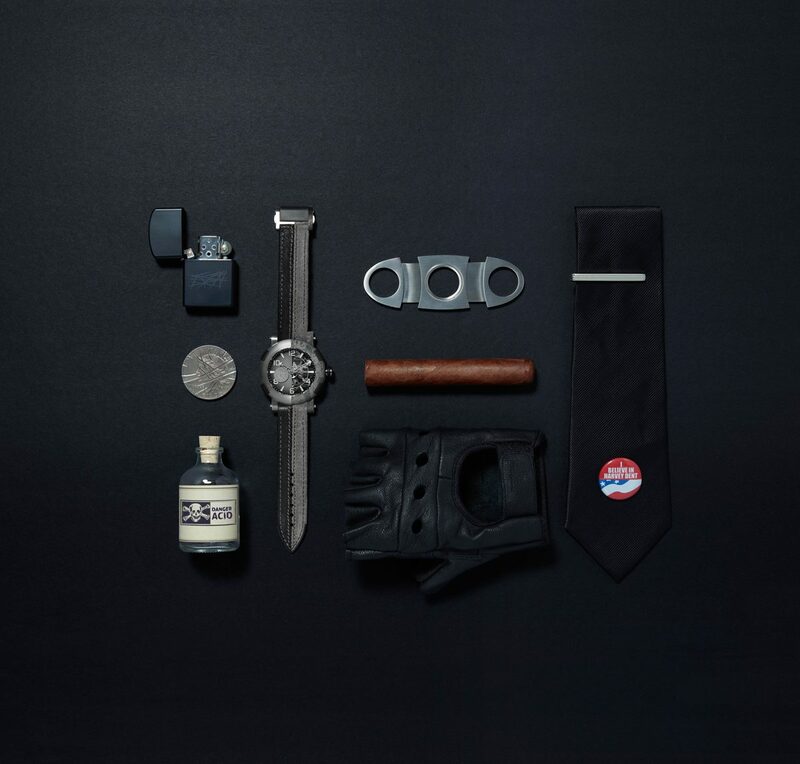 Each leather strap is lined in hard-wearing rubber, while a third full-rubber black strap ensures the entire watch is waterproof to depths up to 100 metres. Each strap is fastened using a titanium deployment buckle clasp.